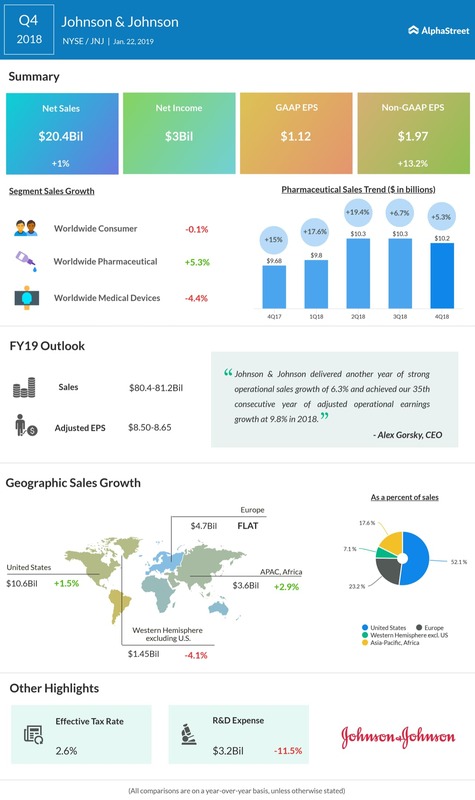 Johnson & Johnson (NYSE: JNJ), one of the first healthcare companies to publish quarterly results this season, will be reporting March-quarter results Tuesday before the market opens. It is widely expected that the world’s largest biotechnology company will post a quarterly profit of $2.04 per share, representing a 1% decline from the first quarter of 2018. There is a high chance of the company maintaining last year’s trend when earnings topped the Street view consistently. Revenues are seen falling 2% to $19.61 billion in the to-be-reported quarter. While the pharmaceutical unit will continue to be the main revenue generator, led by Imbruvica, Darzalex Stelara, and Zytiga, experts warn of a slowdown in sales this time. However, the impact will be moderated by the stable demand for consumer health products and medical devices. For long, the management has been bullish about organic sales growth, buoyed by the company’s robust portfolio that is known for its stability. 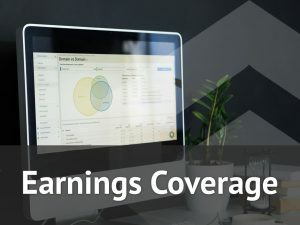 Since the earnings report is unlikely to bring any big surprise, investors will be looking for updates from the management on the future performance and dividend, which the company hiked in every quarter for more than five decades without fail. The management is also expected to comment on its strategy to tackle headwinds like competition and litigations over product safety, especially those related to the alleged presence of cancer-causing substances in some talc brands. It is speculated that the expiry of patents for several key drugs, such as Velcade, Tracleer and Zytiga, will impact revenue growth going forward due to competition from the generic versions. In the fourth quarter, total revenues edged up 1% to $20 billion even as Pharmaceutical sales growth slowed form the preceding quarters, while the Medical Devices and Consumer segments slipped into the red. Adjusted earnings jumped 13% to $1.97 per share. Known for its penchant for innovation, the company acquired California-based Auris Health for $3.4 billion in February, expanding its presence in the robotic health products market. After integration, Auris is expected to contribute significantly to the medical devices segment, which is facing a slump due to competition. Last year, Johnson & Johnson’s shares witnessed an upswing and hit a record high in the second half. However, they retreated to the pre-boom levels by the end of the year. Since the beginning of 2019, the stock moved up 6.4% and is currently trading near the $135-mark.